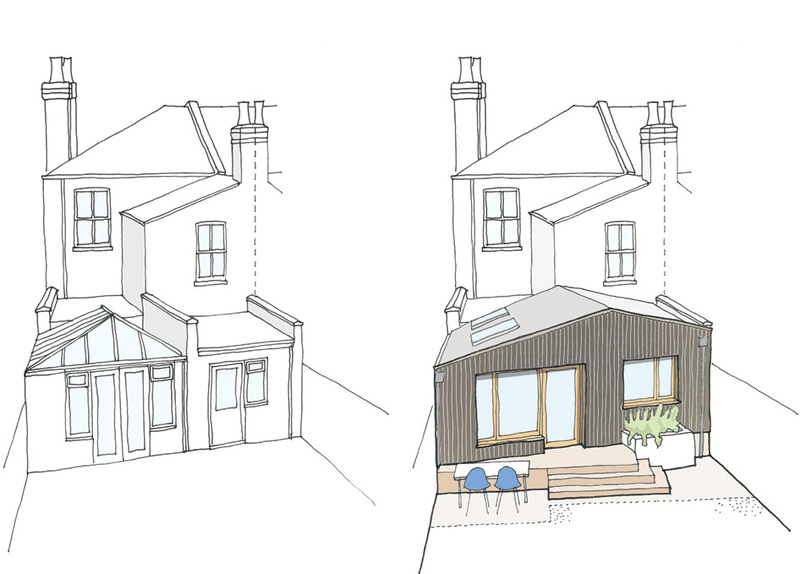 Our South East London project transforming a terrace on a shoestring is progressing well. The owner of this this South-East London end of terrace house came to us with a problem. At the back of her home she had inherited a badly built poky kitchen and a conservatory that was either too hot or too cold to be useful, however her budget did not extend to starting again with a new grand addition. By opening up the wall between the conservatory and kitchen and building a new lightweight insulated low pitched roof with a large roof light we have been able to cleverly transform her home with a light and airy eat-in kitchen. Combining off the shelf units with bespoke birch plywood doors, shelving and a window seat, gives the space a modern Scandinavian look.